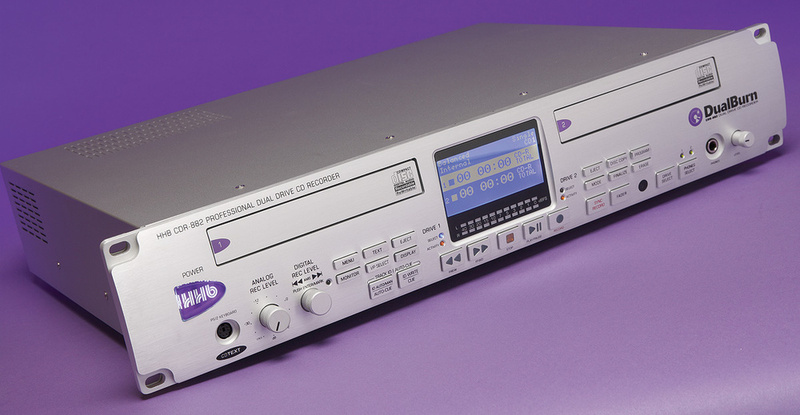 Newer technologies may be available, but the CD is still alive and kicking... and this unique stand–alone recorder is arguably the pinnacle of CD technology. Photo: Mike CameronIn many ways, audio CD–R recorders feel like old technology these days — but HHB don't think so, and this British company have come up with some interesting refinements and uniquely fresh ideas for their latest bespoke disc recorder, the CDR882 DualBurn. This new machine is aimed at a wide range of potential markets, including educational, theatre, live sound, houses of worship, music studios, broadcasters, duplication companies and, yes, even the humble project studio, where its clever features and stand–alone independence offer some very useful and practical advantages. The 882 DualBurn is, as its name suggests, a dual–transport CD player/recorder. Both drives are capable of recording to blank CD–Rs — and at the same time — or one drive can play back while the other is recording. However, there's only one set of stereo inputs and outputs and a shared set of transport controls that must be allocated to control the relevant drive. The unit is contained in a chunky 2U rackmounting case weighing 6.7kg and extending about 310mm behind the rack ears. An internal universal power supply accepts 100–240V AC, so there won't be any problems using it in a touring live sound rig. The rear panel is well equipped with XLRs for balanced stereo analogue audio in and out (at a nominal +4dBu — maximum input level is +24dBu for 0dBFS), as well as RCA phono sockets for –10dBV in and out. Digital I/O is also well catered for, with AES3 (XLRs), S/PDIF coaxial (RCA phono) and TOSlink optical in and out. A word-clock input is also provided on BNC (complete with a 75Ω termination on–off switch). DAT and MiniDisc IDs, as well as CD PQ–codes embedded in the S/PDIF data stream, are recognised and translated into track start IDs as appropriate, and the digital inputs are routed through a sample–rate converter that accepts sample rates from 32 to 96kHz. The analogue inputs (and outputs) are handled with high–quality 24–bit converters, and noise–shaped dithering is included on all inputs to optimise signals for the 16–bit CD word-length. A PS/2 socket allows a keyboard to be connected for CD Text data–entry, and two nine–pin D–sub sockets allow multiple CDR882 machines to be linked via a standard RS232 serial remote–control protocol for duplication duties. A third nine–pin D–sub accepts parallel wired remote–control inputs. A comprehensive infra-red handheld remote–control unit is also included, along with a couple of blank HHB CD–Rs to get the new owner started, UK and European mains leads, and a comprehensive, easy–to–follow handbook. The brushed–aluminium front panel is quite busy — as you'd expect of a dual disc burner — but the buttons are large, nicely spaced, and well labelled. The two CD drawers fill the top half of the panel, either side of a large backlit LCD screen, along the bottom of which is a chunky LED stereo bar–graph meter spanning a 40dB range. The HHB logo on the left-hand side doubles as the mains power button, and below that is a second PS/2 keyboard socket, which is more accessible than the rear socket if you only need to use the CD Text feature occasionally. Two rotary controls comprise a conventional analogue input–level knob, and a rotary encoder to set the digital input level. The latter also has a push–switch function, which is used to set mark IDs, and it can be used during playback to skip through a track. The transport controls are below the display and blue LEDs indicate which drive is currently selected (adjacent orange/green LEDs indicate the activity of each drive). Running along the bottom of the panel at the same level as the transport controls are further buttons to select and write auto or manual IDs, start the Sync Record mode, activate the built–in fader function, and control what is monitored via the headphones output. The machine's configuration buttons are grouped to either side, and to the left they provide access to functions including Input Select, Set–Up Menu, Time Display, CD Text, and Input Monitor, while to the right they provide Disc Copy, Operating Mode, Finalise, Program and Erase functions. All fairly self–explanatory if you're familiar with HHB's previous CD–recorders, but well explained in the handbook in case you aren't. A quarter–inch headphone socket completes the right–hand side of the panel, with a drive–select button and volume control. The rear panel of the CDR882 hosts a number of different input and output options for audio, synchronisation and remote control, helping to make it a very versatile tool.This machine's feature set is complicated because of HHB's attempt to make it suitable for all possible professional applications — there's immense flexibility and configurability here — but the menu system makes setting it up and changing modes fairly painless and quite logical, and the basic disc–burning functions are all completely conventional. It is the inclusion of two CD–R drives, however, that opens up a whole world of possibilities, and HHB have been very inventive in taking advantage of them. The most innovative feature is called DiscSpan mode, in which long–duration recordings can be made which span two or more discs, complete with either manual or automatic switching, automatic fade in and out, and a user–defined overlap duration. Track ID marks and CD–Text data are used to automatically order, synchronise and switch seamlessly between the recorded discs on playback (or to allow reconstruction of the original continuous file in a DAW). I don't know of any other CD–R machine with this capability. An alternative operating–mode ('DualBurn') allows the machine to be configured to record the same audio simultaneously to both drives. This provides two independent copies from the same audio input — and a 10–second RAM buffer (for all record modes) ensures that there are no nasty surprises. It's also possible to copy material from one disc drive to the other, of course, with basic track editing functions if required and at one of three optional duplication speeds (4x, 12x or flat out!). In use, the machine feels very rugged and solid, and I found it considerably more responsive than the HHB CDR850, which I still use regularly. This new machine only takes about 12 seconds to be ready to play a new disc, for instance, whereas the 850 seems to take half a day! With two drives and only one set of I/O, it's inevitable that there will sometimes be a need to reconfigure the machine's allocation of I/O to one drive or another — and the same for the headphone monitoring — but this is performed very quickly, easily and logically through the Menu screen. However, in most applications I expect the machine could be configured to work in the most convenient way and left in that mode quite happily. Usefully, there are facilities to allocate output priority to either drive, or simply mix their outputs (with 6dB attenuation, if required). Another nice feature is that the Fader button does more than it might at first appear, functioning in playback modes as well as in record. In record it provides a simple automatic fade–in or –out over a user–set duration as you'd expect, but in playback mode pressing the Fader button starts playback with a fade up, and pressing it again fades the track out before entering pause mode — potentially very useful in broadcast, live sound and theatre applications. During the review period, HHB sent me a beta firmware update in anticipation of the full v2 release (which should be fully implemented by the time you read this). Upgrading the machine's firmware is trivially simple, and only requires that the update (in the form of a faux–WAV file) is copied to an audio CD–R and loaded into the first disc drive. When the disc is scanned, the machine recognises the update and asks the user to push the Record button to install it. The new v2 firmware extends and enhances a variety of features, such as enabling DiscSpan and DualBurn modes in multi–machine installations, introduces a zero–overlap DiscSpan mode, and allows CD–Text to be added after a DiscSpan recording. The v2 firmware also allows fully independent recording on the two drives (but from a common input source, of course), implements adjustable output levels, and enables auto–cue to operate when the automatic music search (AMS) control is used to select a track when the disc is not playing. Another very useful improvement is that the headroom margin display now only peak–holds in record mode — which makes it far easier to adjust and align input levels when using the Input Monitor function. In all, v2 brings 23 updates, many of which relate to improved remote–control functionality and track ID handling, providing provide clear evidence of the way HHB listen and respond to user feedback, and of the inherent flexibility of the 882's hardware design. Although it's probably not something that will interest many people, I was pleased to discover that this machine is able output via S/PDIF the encoded bitstream of DTS–encoded discs in play mode (there is no built–in decoder, so analogue outputs remain muted), and even record a DTS bitstream via a digital input (provided the dithering function is turned off). It can also copy DTS–encoded discs. However, unlike most modern CD players, the 882 can't decode and play back more common non audio–CD formats — so it won't play MP3 compilation discs, for example. Sonically, the 882 is an impressive performer, easily matching previous generation HHB CD–R machines (which have always been good), and bettering many from other manufacturers. In my tests, the digital outputs were always rock solid, with very low jitter rates, and the analogue outputs performed very well too, with low noise, great stereo imaging and a neutral character — in other words, exactly what any pro user wants. The CDR882 is an impressive, unusual and ingenious machine that really can be all things to all men/women/transgender/species (delete as appropriate). Whether you want a compact dual–playback system, a high–quality duplicator, a long–duration recorder, a machine that makes identical and simultaneous master and safety copy recordings, or even a combination of all three, this is the ideal solution. While computer DAWs and solid–state recording machines may be conspiring to make traditional CD–R recorders look old-fashioned and clunky, in reality I think there is still a lot of life left in the CD yet, and the CD–R is still extremely practical, cheap and convenient — easily capable of meeting the needs of a great many audio industries. With the clever innovations and versatility of the CDR882, HHB are meeting those diverse demands in an elegant way that moves the goalposts much further down the road of obsolescence, and puts off the fateful day when the CD–R format is discarded. This machine deserves to do very well indeed. There is nothing on the market with the same feature set as the HHB CDR882. High-quality converters, SRC and dithering. Comprehensive operating modes and options. Providing so many features makes operation slightly more complex than simpler alternatives. An impressive and ingenious double CD–recorder with the unique ability to make continuous recordings spanning multiple discs, in addition to all the more obvious facilities associated with a dual–drive machine, including disc copying, master and safety copy simultaneous recordings, and dual replay. Sennheiser +1 860 434 9190.